الموضوع في 'قسم الرياضيات' بواسطة ابن الخطاب, بتاريخ ‏نوفمبر 18, 2008. 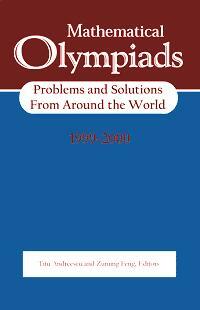 Contained here are solutions to challenging problems from algebra, geometry, combinatorics and number theory featured in the earlier book, together with selected questions (without solutions) from national and regional Olympiads given during the year 2000. Intended for the serious student/problem solver, these books can help to improve performance in the Mathematical Olympiad competition. However, for those not entering the competition, there is much to challenge any mathematician, even those with advanced degrees. Different nations have different mathematical cultures, so you will find that some of the questions are extremely difficult and some rather easy. There are a wide variety of problems especially from those countries that have often done well in the IMO. Anyone interested in mathematical problem solving will encounter some beautiful mathematics in the pages of this book. If you are up to a real challenge, take some of these problems on! آذآ سمحت يآأخي الفاضل ..